Microsoft and Activision have joined the long list of publishers to keep their stock out of GAME stores. It's hard to imagine things getting much worse for beleaguered videogame retailer GAME, and yet it would seem that they just did. A leaked internal memo acquired by MCV indicates that publishing giants Activision and Microsoft have decided against providing the company with any further stock. That means Cabela Big Game Hunter 2012 and Zhu Zhu Babies from Activision, and Kinect Rush: A Disney-Pixar Adventure from Microsoft will not see the inside of a Game store, nor will the limited edition Star Wars-themed Xbox 360 console. The games may not be the biggest blockbusters ever, at this point every lost title hurts. Or maybe it doesn't. Game's situation is so dire at this point that the loss of more publishers, even big players like Microsoft and Activision, might just be the 1,001st cut. Would the presence of the new Big Game Hunter or Kinect Rush really be of any aid to Game's fortunes? I rather doubt it. Somewhat unexpectedly, Sony is standing by Game, at least for now, providing the retailer with PS Vita systems and copies of the new Twisted Metal. 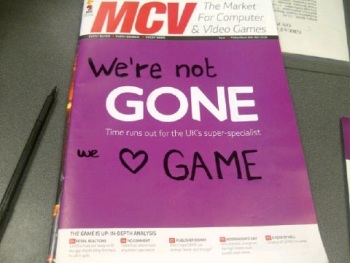 And Game CEO Ian Shepherd remains defiant; referring to the latest print edition of MCV, which featured a modified version of the Game logo and the line, "Time runs out for the U.K.'s super-specialist," Shepherd posted on Twitter a photo of the magazine modified to say "We're not gone," describing it as "the cover MCV should have done."